In the great Mesoamerican barrier reef, also called Maya or Mexican Caribbean, there are up to 500 species of fish and about 65 species of stony corals. 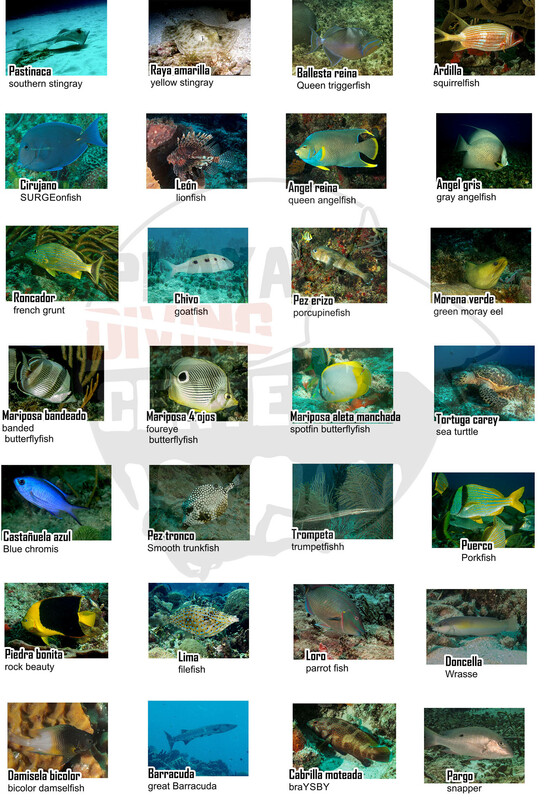 Parrotfish, grunts, groupers, jacks, barracuda, sergeant fish, butterfly fish, sea turtles, moray eels, sharks, rays, crabs, lobsters, sea fans, brain corals, elkhorn corals and much more. In the Caribbean sea of Playa del Carmen you will find a rich variety of coral, all of them from 30 to 100 ft, suitable for all diving levels The average visibility is 100 ft, many days above 130 ft. The Caribbean offers incredible dives. The water temperature ranges from 79 degrees in winter to 84 degrees in summer. An ideal temperature 12 months a year. We dive at all the dive sites of Playa del Carmen, the best area along with Cozumel in Riviera Maya. Coral reefs full of life with very good visibility. Most of the dive sites are close to shore, 10 to 30 minutes sailing. We dive in small groups of 8 divers maximum. Following the Caribbean style, we make drift dives: we drift with the current and the boat picks us up at the end of the dive. Morning dives. Double tank. Depth is set according to the group level. Afternoon dive. Single shallow dive. There are dive sites for all levels. We drift with the current without returning to the anchor point. The boat follows the group and picks them up at the end of the dive. 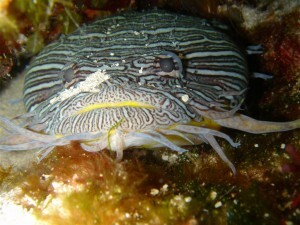 Dive Sites: Arcos (100 ft). Cabezos (50 ft), Brain coral reef (40 ft), Green Wall (100 ft), Moc Che (30 ft), Moc Che deep (100 ft), Chun Zun Bul (30 ft), Jardines (30 ft), sabalos ( 50 ft), Barracudas (50 ft), turtle reef (50-80 ft), Mama Vina Wreck (100 ft), Punta Venado (60-100 ft). Cozumel island, definitely the best reef in Mexico. Cousteau described Cozumel as one of the best in the world. Cozumel island has over 25 different dive sites for all levels. Cozumel was declared a Marine Park by the Federal Government of Mexico in 1979. Its wall dives have amazed millions of divers in recent decades. Its warm and clear waters make it an easy and accessible dive. Do not miss wall diving in Cozumel. The island of Cozumel is 150 miles long by 60 miles wide and it is 12 nautical miles away from Playa del Carmen. Most of the dive sites are on the west side of the island opposite to Playa del Carmen. Diving in Cozumel: Santa Rosa, Palancar, Colombia and Maracaibo, Dalila, the French, Torments, passing Cedral, Paradise, Chankanaab Yucab, Punta Tunich, San Francisco.